The foundation of the OceansAdvance ocean technology cluster in St. John’s, Newfoundland, Canada is a unique concentration of research and development facilities. The cluster’s success is a result of synergies between the private sector, R&D facilities and Memorial University, and public investment. Virtual Marine Technology and ICAN Ltd. exemplify these synergies. Ideally located in the North Atlantic and bounded by the sea, St. John's, Newfoundland is emerging as a world-class centre in ocean technology. In 2008, New York-based Marine Technology Reporter referred to St. John's as "an international epicentre of marine technology". Major public investment in oceanfocused research and development facilities has played a key role, as has St. John's' 500-year maritime history, significant offshore oil exploration and development, high-calibre engineering graduates, and an island culture that values networking and community building. OceansAdvance Inc., (website 1), the organisation established to nurture the development of Newfoundland and Labrador's ocean technology cluster, comprises 50 companies and 10 research and development and educational institutions, most of which are located in the St. John's metropolitan area (population: 180,000). Key areas of innovation include: marine simulation to support vessel and rig design and operation in harsh environments; autonomous underwater vehicles; underwater instrumentation and acoustics; and ship management systems. Leslie O'Reilly, executive director of OceansAdvance, explains that the organisation modelled itself after Finland, Norway, Sweden, and Denmark's success in building their knowledge economies. "They have a small population but a tremendous position worldwide," he observes, attributing their success to both a culture of collaboration and strong alignment between R&D and government programmes. OceansAdvance has targeted USD1 billion in ocean technology revenues-a four-fold increase from 2006 levels-by 2015. Critical to the cluster's success is collaboration between R&D and industry-joint projects and programmes that place graduate students in companies-as well as the high priority the province has placed on the ocean technology and energy sectors. The National Research Council's Institute for Ocean Technology (IOT) is the linchpin for the cluster's R&D capability. The Government of Canada established this facility in 1984 to leverage the technology development opportunities presented by the province's exposure to, and expertise in, harsh marine environments. "We know the cold ocean, waves, ice, and storms," says IOT director Dr. Mary Williams. She points out that the world's longest ice tank (which holds 76 metres of ice), a towing tank, and a wave tank are all under the same roof, and the Marine Institute's flume tank is less than one kilometre away. "This concentration of facilities for harsh marine environments is unparalleled in the world," she observes. In addition, 30-year-old C-CORE, also located in St. John's, provides expertise in intelligent sensors, geospatial systems, iceberg engineering and geotechnical engineering. A technology development partner for companies that don't have their own R&D department, IOT focuses on marine safety, underwater vehicles, Arctic engineering, and performance evaluation. Williams adds that IOT is currently collaborating with Memorial University in all four areas. One company that has benefited from collaborations between IOT, the Marine Institute, and Memorial University is Virtual Marine Technology (VMT), which develops simulators for lifeboat, fast-response craft and high-speed electronic navigation training. VMT's products were developed with operations and training expertise from the Marine Institute, scientific expertise in lifeboat performance in the high seas from IOT, and ocean engineering expertise from the Faculty of Engineering at Memorial University of Newfoundland (MUN). Randy Billard, a graduate student in MUN's Ocean and Naval Architecture programme who was tasked with running the project in 2003, later negotiated the commercialisation rights and established the company. "Since the Ocean Ranger (a drilling unit that sank offshore Newfoundland in 1982 resulting in the deaths of all 84 crew members), the National Research Council has done a lot of work on offshore safety and lifesaving appliances," explains VMT president Anthony Patterson. "They have over 20 years of experience and data, which was a key component for us. They're one of the only places in the world that has the facilities to get the data you need to make sure the simulators are realistic enough for training." IOT and MUN staff also created the mathematical models that underpin the simulation software. "The Marine Institute provided mariners who really understand the problems with lifeboat training," recalls Patterson, "and help in how to address the problems with a simulator, how real the simulator has to be, and how to operationalise simulation into a training course". In May, VMT received international certification for their lifeboat simulator from Det Norske Veritas. "This never could have happened without the university, the Marine Institute, and the IOT, all of whom were at the centre of this from the beginning," observes Patterson. Another company that has collaborated with the Marine Institute is ICAN Ltd. ICAN designs and implements both navigation and communications systems including electronic charting systems, and AIS software and systems. ICAN was acquired by CNS Systems of Linköping, Sweden in 2008. In 2006, ICAN partnered with the Marine Institute to provide electronic chart-integrated AISs on eight fishing vessels and work boats that operate in Placentia Bay, Newfoundland, one of the busiest ports in Canada by petroleum cargo volume (approximately 25 million tons annually). The purpose of the initiative was to demonstrate the importance of situational awareness for both small vessel operators and oil tankers. ICAN supplied the AIS transponders and the company's Aldebaran electronic chart navigation software. 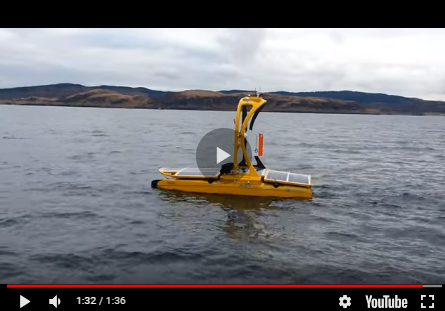 The system integrated the radar, anemometer, GPS, and AIS, as well as meteorological-oceanographic data coming from three "SmartBay" buoys the Marine Institute deployed in Placentia Bay. The buoys provide mariners with a variety of near-real-time data including wind and current direction and speed, and wave height and direction. ICAN developed the system that integrates the buoy data into the electronic chart display. Once developed, "We made it a standard part of our product offering", reports Neil Chaulk, ICAN president and CNS Group's marketing and sales director. ICAN has since sold this feature set in products supplied to many international customers including the Middle East Navigation Aids Service, National Oceanic and Atmospheric Administration, US Army Corps of Engineers, the US Coast Guard, and General Lighthouse Authorities in the UK. "Developing that system for the Marine Institute put us at the leading edge in our field," says Chaulk. "It drove us to leapfrog our competition technologically, and gave us a good push to develop the next generation software suite for AIS infrastructure management." Looking to the future, OceanAdvance's O'Reilly says, "The linkages between the ocean technology companies and the oil and gas sector are providing tremendous opportunities for us to grow new projects and initiatives."